"Go West" Feral Woman: familial fashion over decades. 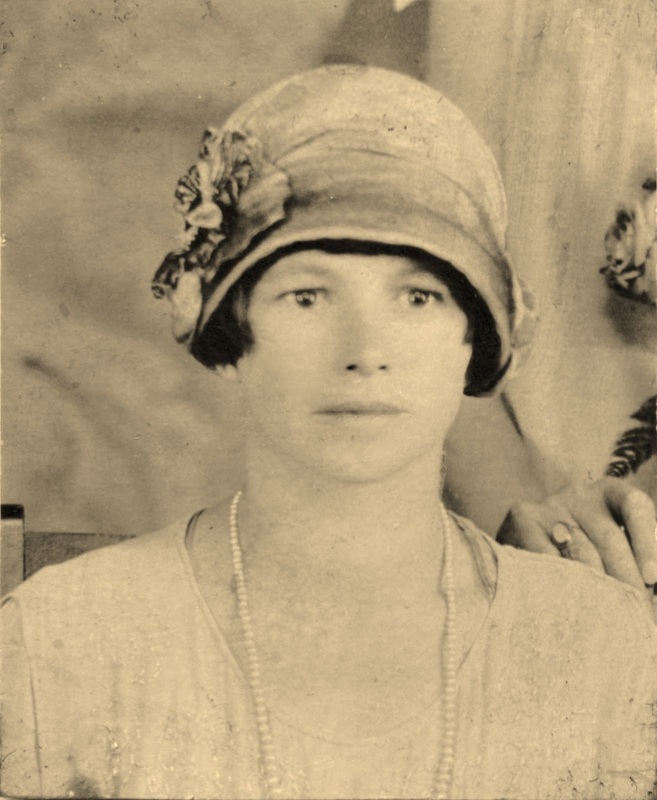 This is my Great GREAT Aunt Anna, on my Dad's side. See, its in my blood! but we'll get to that some other day! No, no, we had no family members in the cast of "Les Miserables". with his sister, we think. and he is wearing a pageboy cap with his wool suit! Take a look at the battenburg lace curtains in the background too. we may be of Austrian descent. because we all love "Sound of Music"
I can strum the banjo while humming. Out with the neighbor girlfriend strolling. Single teenage girls in Chicago! the foo foo collars too. or if she designed it that way. That could be dangerous in today's Chicago, you know. This is my Great Aunt Grace on my Dads side. Thats why they had fun. she naughtily rolled down her silk stockings around her ankles! OOOH, she be trouble ! This is my mother's mother, Katy. By the 1930's you were a rebel if you DIDNT cut your hair. I get lost in her eyes when i see this. She was married twice like me. but I know from her story she was a woman of courage and strength. "Ive spoken my peace and counted to three..."
to his monogrammed in blue embroidered hankie. My beautiful mother, Helen, in her RN uniform. Another suit, another day in the life of a GQ 1940's man. Crap, he even matched his shoes. How many men do you know even match their SOCKS? 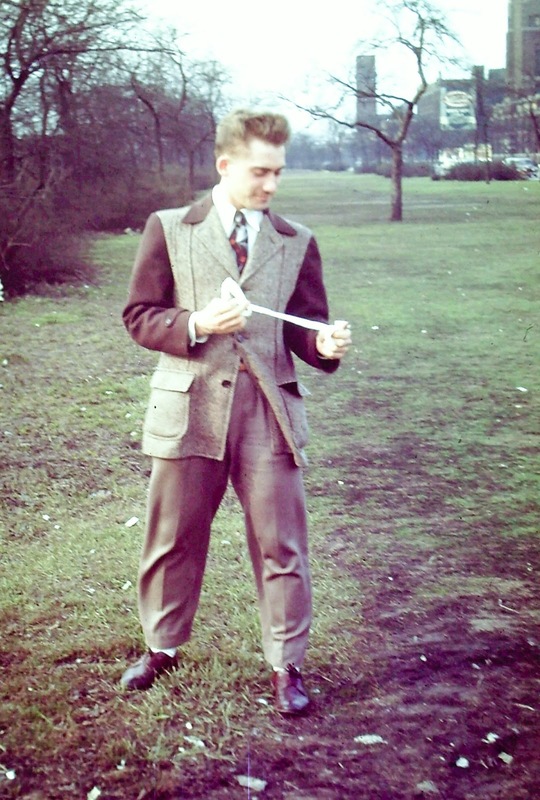 My Uncle Lennie, my Dad's brother, was a long time bachelor and liked to have all the latest things. 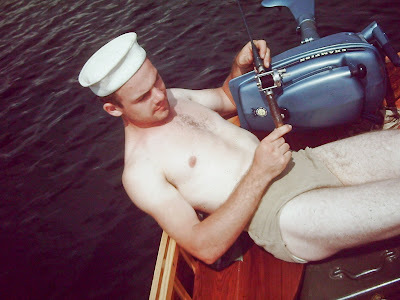 Did you know speedo shorts came out in the 1950's? we apoligise - you didnt need to see that. 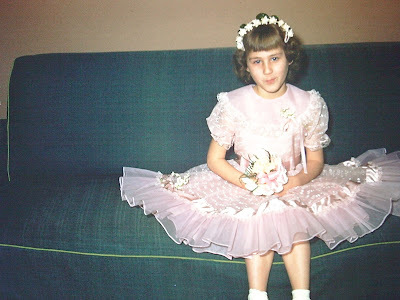 this is my beautiful sister K.
She got to be in weddings because she wore frilly crinoline dresses well. shes long legged and got that model look, even to this day. this is why she is a librarian who wears sensible shoes today. next to my pretty sister N. in her pretty blue going to church dress holding the pretty cute pocket dog? bright red pattern "hid the dirt" shorts and a top that will not stay white for long. Yep, that is the natural state of my hair always. Dog's giving me the side eye; you can tell I just was told to not pet the dog. chase after the butterfly that just flew by. yes it was hard being me. thats okay because I got this. Yep. great Grandma - Bushia ("buooo-shh-a") again. Id pay money if someone could tell me what colors they were too. I bet she had a field day with her family coming up with this stuff. when Im in my 80's I will wear anything I darn well like and will pet all dogs. This is just sweet...thanks for the wee peek into your familial fashion history! Oh Oh OH I am so excited you would have thought this was my family I have to say I love your aunt Grace she was a rebel bucking the trends just like your dear Grandma Bushia LOVE this woman. I love the fancy outfits and I am secretly happy I do not have to put that much thought into getting dressed and looking so good in the morning. I have to say LOVE Grandma Bushia a woman who knows who she is and is not afraid to show it just like someone else I know. That was probably one of the best and most refreshing looks at family history I think I've ever seen. Came to visit through Buttons, by the way, who is a big fan of yours for good reason. My dad had a Speedo swimsuit in the 50's. Turquoise blue. A definite fashion forward kind of guy. Your dad is very stylish- love the hair; it's not just the wimmens in your family that can rock style. Your great grandma looks like a force to be reckoned with. And you look just like your mother. Katy is gorgeous! She even looks like a Katy. Makes me want to get my hair bobbed! Your parents are gorgeous too. What a love story...just like in the movies. Speedos...eeecchhh...why did they invent them? What a wonderful assortment of photos...I mean family! :) I enjoyed you anticdotes about this wild and crazy beautiful family. Thanks for the wonderful romp through time with your family- All lovely folks! Especially Katy, wow, so pretty! People certainly made an effort back in the day! Even motor boat uncle- his of course! Well the entire post was - just swell and I appreciate it very much. This is an awesome post. I love vintage photos, and the fashion of the times. I love to see where people originated. I have always felt like I was born a century to late anyway. Thank you! What great photos! It's so awesome to have those and look back in the history of your family. Love, love your white curls. What a cutie! Love this trip back through time with your gorgeous ancestors! Amazing photos. So fun to see the changing styles. I still firmly believe that even if I'd been born in the 1800's, I'd never wear a dress! i'd have been a total pants rebel. Love looking at old family photos...even other peoples. Okay, girlfriend. Got a question for you. Just why the heck are you gonna wait until you're 80 to wear what you want? What's wrong with tomorrow, I want to know. Huh??????????????? Hope you and Mr. Foresterman are doing well. Hugs. WoW, another great entry!! your mom was beautiful in her nursing uniform and cap, back in the day when nurses wore white and caps!! you are a cutie pie with a devilish grin, i like that!! hilarious! that last picture...hee hee. While the pictures speak for themselves, your comments are just wonderful. 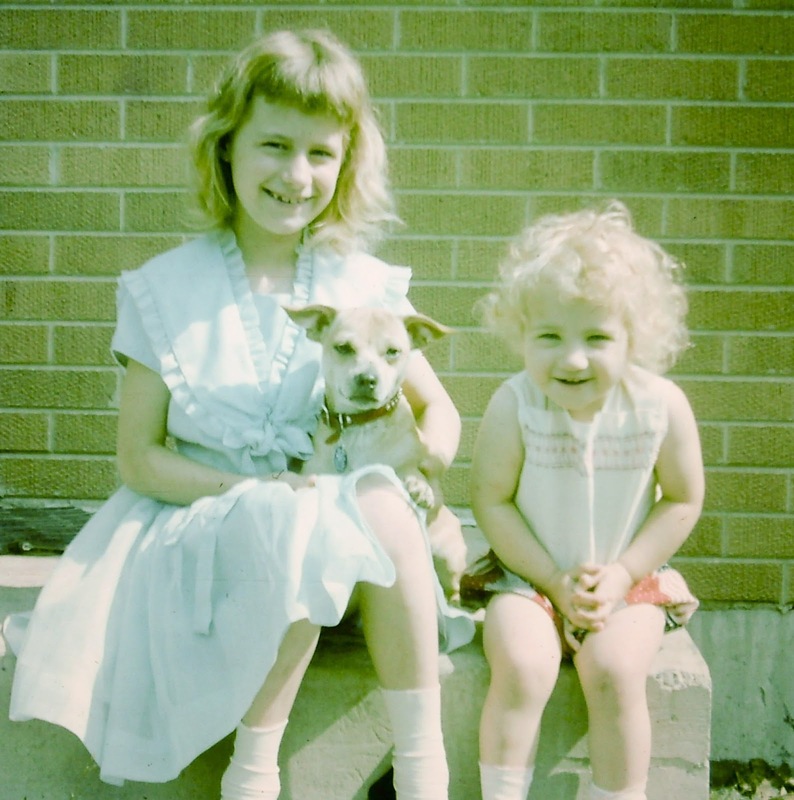 Your mother and grandmother were beautiful, the clothes through time are fabulous, and you, your sister, and the dog are priceless in that photo. Great post, you have some gorgeous family members...now I know where those good looks came from. I love seeing fashion from the olden days....pretty cool. 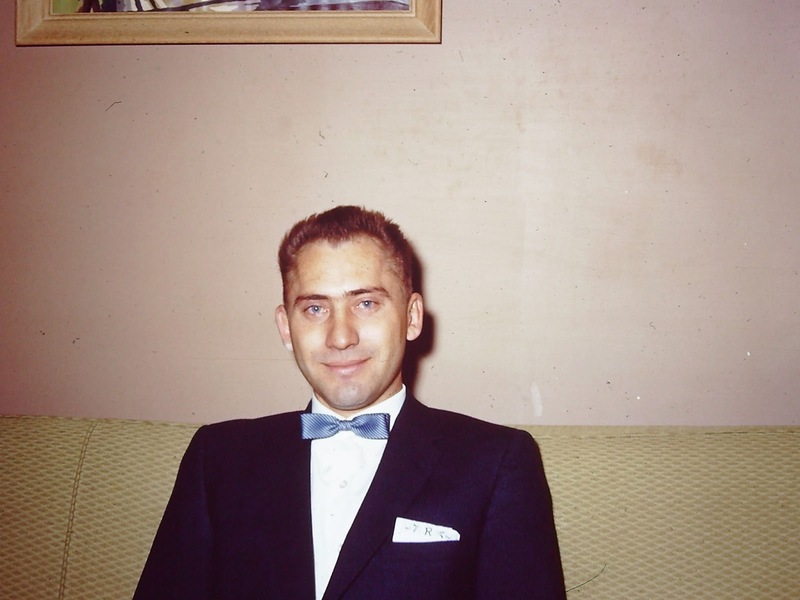 What fun to have all of these amazing photos of your family -- going back as far as they do. I really enjoyed learning about some of the nuts on your family tree. Lol. These photos are fabulous, but then you already know that. My old photos are still packed from when I moved here from Atlanta 3 1/2 years ago, but since I'm moving again later this year I will eventually drag them out and scan them. I thoroughly enjoyed seeing yours! Interesting bunch there feral ... super fun and fab , so that's where you get all that character from!